AUSTIN — While not clear of the drought, things are looking up in many parts of the state this year and the outlook for deer and deer hunting is much brighter. Archery-only deer season opens Saturday, Sept. 28 and runs through Nov. 1. The general firearms season begins Nov. 2. The special youth-only deer seasons are Oct. 26-27 and Jan. 6-19. Biologists can provide some general predictions each year based on rainfall and general habitat conditions that are applicable at a landscape level scale, but whether those predictions hold true for individual properties is like trying to guess the Lotto numbers on the Saturday night drawing. Factors like rainfall, availability of native foods like acorns or mesquite bean crops, habitat quality and availability, even hunting pressure, play a role in shaping your hunting success. Aside from rainfall and general habitat conditions biologists also consider previous year’s deer population characteristics to make predictions for the upcoming season. “One factor hunters should also keep in mind is the good carryover of deer from the 2012 season as harvest was down resulting from heavy acorn and mast crops in several regions of the state,” Cain notes. “For hunters this translates into plenty of opportunities to harvest a deer.” Though the deer population numbers are expected to be good this year, Cain predicts the recent September rains that resulted in a flush of green vegetation may cause bow hunters to rethink their early season hunting strategies as deer may spend less time visiting feeders. A well-traveled game trail may be more productive than hunting at the deer feeder. Dry conditions in 2011 resulted in a significant decline in fawn production, down to 29 percent for the statewide estimate, a 24 percent departure from the long term average. Fawn crops bounced back in 2012 at 47 percent and Cain anticipates survey results will show a higher fawn crop this year. In fact, Cain is hearing reports from landowners as well as TPWD biologists of fawn production in the 60 to 80 percent range in the Hill Country and similar reports of good fawn production in other areas of the state. For hunters fawn crops may not be as meaningful since harvest is generally focused on older age class deer, but remember those fawns this year translate into your adult deer several years into the future. Another aspect of typical hunting season forecast is the prediction of antler quality and how many big bucks are out there across the landscape. Some managers provide supplemental feed to buffer against nutritional impact resulting from drought. However, research in South Texas has shown that native habitat is crucial to deer nutrition even when supplemental feed is provided. So maintaining quality native habitat on your property is important. Cain predicts antler quality to be above average for those areas receiving good spring rains and average for those that were a little drier this spring and summer. The good news is that drought or no drought, Texas still produces some whopper bucks each year. According to an article published by Boone and Crockett several years back Texas ranks fifth all time for entries into B&C record books. Based on 40-plus years of data collected by TPWD biologists each season the average B&C score for a 5 ½ year old buck is 124, with 9.1 points, and a 15.8 inch inside spread. Even the younger bucks at 3 ½ years of age average a 13.5 inch inside spread and 8 points. While areas like South Texas are known for producing exceptional bucks, most anywhere in the state is capable of producing good bucks every year. In fact in 2012, two archery hunters were lucky enough to connect on a couple of large non-typical bucks scoring about 250 Boone and Crockett. Both bucks were wild, free-ranging deer taken on low-fenced properties, one in North Texas and the other in Southeast Texas. Hopefully, that trend will continue in 2013. Digging a little deeper into the data Cain explains that in antler-restriction counties, 59 percent of bucks checked during TPWD surveys were 3 ½ or older, a dramatic improvement in age structure when those older age class bucks represented only 30-35 percent of the harvest before antler restrictions were implemented. Overall, the 2013 season is expected to be a good one with great opportunities to harvest a deer. 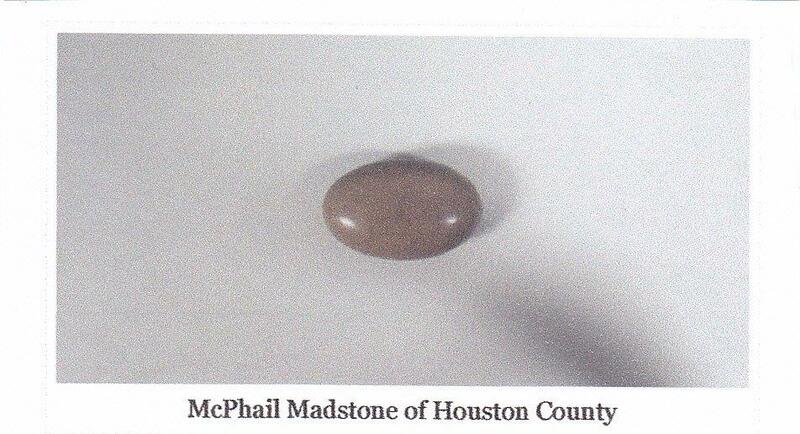 In the 1890s, mad stones were widely used in East Texas for the treatment of rabies. These small stones were occasionally found in the stomach of wild animals, especially deer. They were akin to bezoars which consisted of a collection of calcified hair and other debris in the stomach. The best grade of mad stone came from a white or spotted deer, supposedly working better than a stone from a brown deer. These little stones came in various shapes and colors, and were believed to have therapeutic properties, as well as spiritual power. People, often children, bitten by mad dogs, cats, foxes, squirrels, cows, horses, and other animals were brought hundreds of miles to use them. In East Texas there were “resident” mad stones in Houston, Dallas, Plano, Corsicana, Denison, Kaufman, and a few other towns. These stones were owned and used by medical doctors, preachers, policemen, as well as private citizens. The famous Kaufman stone was kept, of all places, at the county treasurer’s office. One mad stone was described as being small, flat, and of a dark gray color like slate. Another was irregular in shape, dark brown, and porous. One of the Georgetown stones was said to be about the size of a small hen egg with one end cut smooth away. Still another mad stone looked just like a chunk of common coal. Well into the first part of the 20th century, the only treatment for somebody bitten by a “mad” animal was believed to be the application of a mad stone. The treatment process was rather simple. The mad stone was first heated in a container filled with sweet milk. Then it was applied to the area where the victim had been bitten. If the stone adhered to the skin, this was a good sign, and recovery was thought possible. Sometimes the stone would cling to the skin for only a few minutes; in other cases up to six hours. During this time, the patient would often walk the floor in pain. When the mad stone did come loose from the skin, it was immediately dropped back into the container of warm milk. If a slimy, green substance appeared on the surface, it was believed this was the poison that had been extracted from the patient. If no tell-tale poison was observed, the wound was re-opened, the stone again cleansed in the milk, and the process repeated until the desired results were obtained. Many rural doctors administered the mad stone treatment as part of their regular medical practice. Preachers, who owned mad stones, often applied them in an atmosphere of spiritual faith, fervently praying the stone would be used of God to heal the unfortunate person. 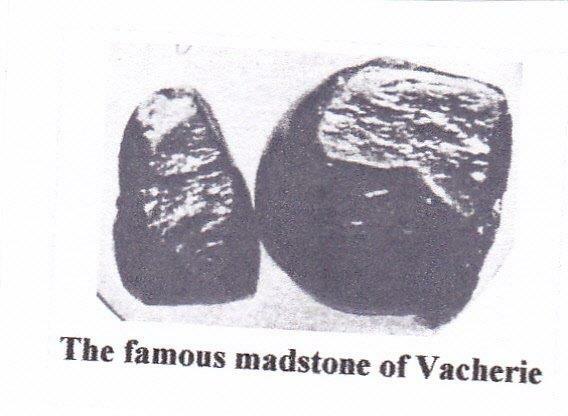 Many of the best known mad stones had impressive histories, credited over the years to have been used to save the lives of hundreds of people infected with rabies. Texas newspapers of the 1890s are filled with detailed accounts of cases where people bitten by rabid animals were apparently “cured” by the application of a mad stone. However, whether it was actually the stone themselves, or simply the peoples’ faith that gave hope and brought about the recoveries will forever remain a point of conjecture. As an aside, have you ever wondered where the term “Dog Days” came from? They were originally called “mad dog days”. These are the hot summer days of August and September when rabies infection among dogs and other animals was at its highest. The mad stone practitioners must have really gotten a workout during this time of the year. As for me, if I was bitten by an animal with rabies, the only way they would ever stick a mad stone on me would be as I was lying on the emergency room table, unconscious, while getting shots in the stomach. But, back in the day there were few doctors in the territory, and doing anything was better than doing nothing, I suppose. Two poachers from Texas hiked more than 14 hours through a marsh to evade authorities. It didn’t work. Some people will go to great lengths to have a crab cake for dinner. Louisiana Department of Wildlife and Fisheries Enforcement Division agents arrested and cited two Texas residents on Sept. 20 for crab theft and other fishing violations in Cameron Parish. Agents arrested Jireh A. Slaughter, 21, and Tevvin T. Jones, 20, both of Orange, for theft of crabs; taking commercial fish without a license, without a gear license and without a vessel license; violating interstate commerce regulations; and resisting an officer by flight. During August and September the LDWF Enforcement Division received numerous complaints of crab theft from several commercial fishermen fishing in Black Bayou in Cameron Parish. Agents responded by increasing patrols in this area assisted by Calcasieu Parish Sheriff’s Office Marine Division deputies. On Sept. 19, a commercial fisherman was watching his own crab traps and observed two men in a vessel stealing crabs from his traps. He contacted an enforcement agent but was observed by the men before agents were able to arrive. The men abandoned their vessel and dumped the harvested crabs in the marsh. The two men then left the vessel and hid in the marsh nearby. When the agents arrived, they called out to the men to come out of hiding. After obtaining the suspects’ names from an overdue boater report from the Orange County Texas Sheriff’s Office, agents then contacted Louisiana State Police, Calcasieu Parish Sheriff’s Office and Cameron Sheriff’s Office for air support and additional officers to assist in the search for these men. After leading a 14-hour search during severe weather and harsh conditions, LDWF agents received a phone call from an Orange County Deputy saying that the two men arrived at their residence. The two men walked through the marsh for 14 hours and swam the Sabine River in order to make it back to Texas. The two men surrendered themselves to LDWF agents at their office in Lake Charles on Sept. 20. The two men were subsequently arrested and booked into the Cameron Parish Jail. Theft of crabs brings a $400 to $950 fine and up to 120 days in jail. Taking commercial fish without a license, without a gear license and without a vessel license each carries a $250 to $500 fine and up to 90 days in jail. Violating interstate commerce regulations brings a $900 to $950 fine and up to 120 days in jail. Resisting an officer by flight carries up to a $500 fine and up to six months in jail. The residents of Hemphill Care Center are looking forward to the coming of Fall which will bring cooler temperatures and fall foliage. Labor Day was celebrated with refreshments served to the residents. We say thank you to all our employees for fulfilling their respective duties every day of the year. Since our last Care Center update four of our friends have passed away. We express our love and sympathy to the families of Herbert Ezernack, Lucille Melde, Max Goodart, and Virginia Broussard. The Resident Council gave recognition to Linnie White and Vicky Tubbeville as Employees of the Month, Molly Marshall was named Resident of the Month, and our September Volunteer of the Month was C J Michael the One Man Band. September worship services and gospel singing were provided by the following: Hemphill First Baptist Church, Fairdale Baptist Church, Bethel Chapel Baptist Church, Hemphill Church of Christ, Community Fellowship Church, Antioch Missionary Baptist Church, Parkway Baptist Church, Bethany Baptist Church, and the Harvest Assembly of God Church. We say thank you to all who came to play bingo with us. They are Hemphill Church of Christ, Kelli from East Texas Home Health, Parkway Baptist Church, Carletta from Consolidated Healthcare Services, and Blair from Texas Home Health. We are happy to welcome our Hemphill Garden Club friends back for another year of activities. The ladies always surprise us with their creativity. The Pineywood Pick’rs entertained us with lively pickin’ n grinnin’ music last Wednesday afternoon. We look forward to the September birthday party honoring Margaret Beadle, Mildred Conn, Sarah Sullivan, Estelle Granger, Mary Smith, Ruby Williams, Eva Powell, Joyce Butler, Bill Ener, and Florence McClelland. The Thursday afternoon party will be hosted by Harbor Hospice. May God bless all that make their home at Hemphill Care Center and all the friends who help our days to be on the bright side. I bought this String Chalk Line because of the warranty. I’ll keep the Proof of Purchase handy should I need to file a claim within a hundred years. 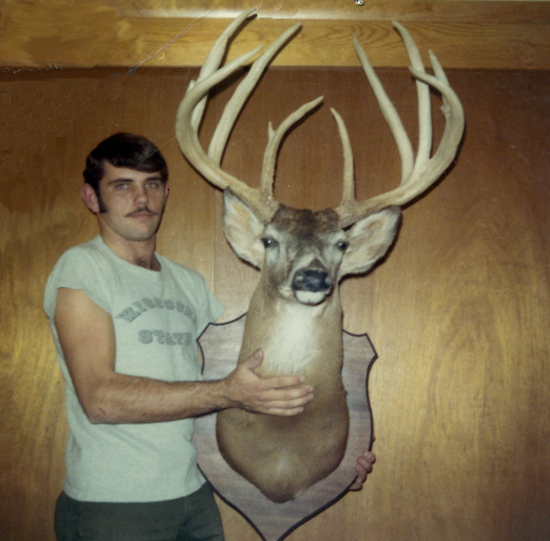 As a college student in 1969, Jeff Brunk didn’t have any intent to kill a trophy deer—just to fill his tag. His chances were good, though, since he was hunting prime whitetail country in Clark Co., Mo. Making his way over a small hill, Brunk saw and killed what he originally thought was a fair-sized buck. Only after approaching did he realize what lay before him—a 199 4/8 B&C trophy that ranks No. 19 all time. I bought a chalk string line with the a 100 year warranty. 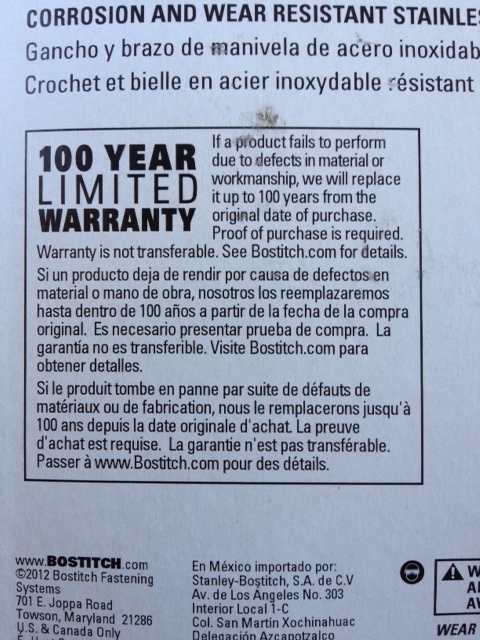 I’m keeping the Proof of Purchase just in case I need to file a claim in 100 years. With its wide open spaces, Montana is the quintessential portrait of the western U.S. It’s also home of the No. 20 typical whitetail of all time, killed by Tom Dellwo in 1974. 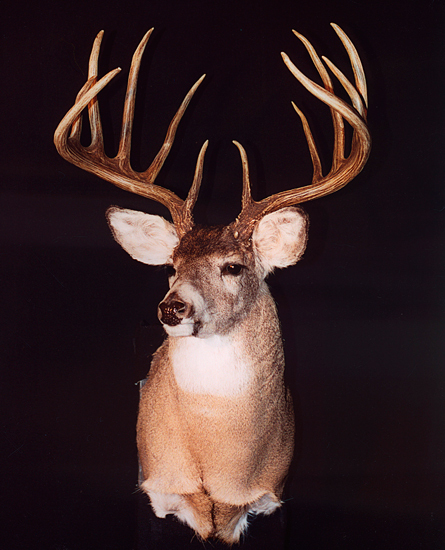 The buck, which was killed in Missoula County, scored a stunning 199 3/8 B&C. Like so many others on our top 20 whitetails of all time list, Dellwo was simply trying to fill his freezer when he killed this trophy whitetail. Two Tarrant County game wardens were checking a field on opening day when they found two men sitting around a stock tank with shotguns and a moving dove decoy set out. The father-son duo was contacted by the wardens and it was discovered that the father, who was from out-of-state, did not have a hunting license. The father told the wardens that he was not hunting dove, and that the shotgun and empty hulls by his seat were from shooting at bullfrogs. The wardens informed the man that he needed a license to hunt bullfrogs, as well. A Shackelford County game warden was checking local fields for early hunters when he found a field with a high concentration of dove. After investigating the sunflower field further, the warden found wheat seed. Later that night, the warden came back to the field to confirm it was baited and found that wheat seed had been spread all the way around the field and in each mowed strip. The next morning, the shooting started and the warden made contact with a group who said they were surprised to see the bait. One subject was even more surprised that the nighthawk he shot was not a dove. Two game wardens received information-including the time and place, that a Mexican commercial fisherman would be out on Lake Falcon picking up gill net. When the wardens checked the lake at the reported time, they saw a vessel without navigation lights operating in the dark. They moved in for a closer look, made contact with the vessel, and found a fisherman pulling in the last section of gill net. He was placed in custody for no commercial fishing license and possession of illegal fishing device (1,980 feet of gillnet). A San Patricio County game warden received an Operation Game Thief call about someone keeping white tailed deer as pets. With the help of another San Patricio County game warden, they found the property where the deer were being kept. Hidden behind a trailer park on several acres of high fence with a mixture of fallow and axis deer were one doe, one buck, and one very young fawn whitetail. After the wardens talked to several neighbors, the property owner was located and questioned. He said that he knew the day would come when he would get caught. He claimed the oldest animal jumped in his pen and never left and the other two were brought to him to be cared for after they were found abandoned. A citation was issued for possession of white tailed deer without permits and the deer were relocated. While driving through the Rio Grande Valley after working during opening weekend, a game warden stopped a vehicle in Brooks County that was being driven erratically and also had an expired registration. After the driver consented to a search, the warden found approximately 25 grams of cocaine for which the driver was arrested. A game warden was contacted by U.S. Border Patrol about some peyote cactus they had found on a ranch. The federal agents were tracking illegal immigrants when they found three burlap sacks full of peyote, and the warden was contacted to help them dispose of it. The total weight of the peyote was 297 pounds with a value of almost $24,000. God often gives me opportunity to speak a word of comfort and encouragement to those who need to see life on the bright side. Friends come to ask me difficult questions such as “Why do bad things happen to good people?’ and “Why does God keep testing me?’ I assure them that God is still God and that He loves us regardless of where we are in life. Bad things happen to good people every day. The devil works rampantly to destroy everything that God has in store for us. The devil wants to keep us from being happy. God always wants us to be happy. He gave his son Jesus, to die upon the cross so that we who believe in Him can have victory and blessings every day. When my friends share their problems with me, they know that I care and will pray for them. I remind them when He brings us to a problem, He will take us through it. I am reminded of the Bible story about Daniel in the lion’s den. God allowed him to be put in the den with hungry lions, but God brought him out of the den without even a tooth mark from the lions. When my friends seem to lose faith in God, I remind them of the story of Job in the Bible. Job lost all of his earthly possessions and his family but Job’s faith remained steadfast. His friends tried to get him to curse God but Job was a just man and remained true to God. When friends come and share that they have friends and family who are critically ill and facing probable death, I do my best to let them know that God loves them and that He is a wonderful source of comfort. It is my prayer that God will bless each one who reads this column and will some way find comfort and strength to live life on the bright side.